That Screaming Goat In Sprint's Super Bowl Ad? It's Actually A Sheep : Goats and Soda Two Super Bowl ads appeared to feature a screaming goat. In fact, one of them was a sheep. 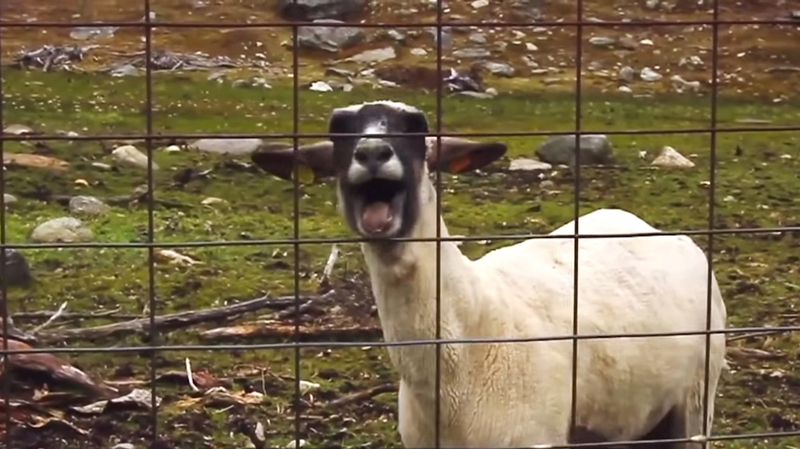 A goat and sheep guru explains why it's hard to tell the difference — and what makes 'em scream. If this farm animal, featured in the Sprint Super Bowl ad, could talk, it would say: "Baaaaaad news for all the people who think I'm a goat. I'm really a sheep!" News bulletin: You know that Super Bowl ad from Sprint that featured a screaming farm animal that was widely reported to be a goat? The one characterized as "Sprint Screaming Goat Super Bowl Commercial" on YouTube. I spoke to two goat experts and they both agree 100 percent: The screamer was a sheep! Of course, I sympathize with the folks who mistook the sheep for a goat because our blog made a similar goat vs. sheep mistake not too long ago. And goats weren't exactly left out of the Super Bowl ad parade. The ad for Discover did, in fact, show a screaming goat. To learn more about the difference between sheep and goats — and what makes them scream — we spoke to Daniel Waldron, who breeds the animals at Texas A&M AgriLife Research. So how do you know that the animal in the Sprint ad was a sheep, not a goat? It had wool instead of hair. But that's not a complete indicator because there are some sheep that have hair as well. The shape and position of the ears, the shape of the head, the color markings — there's a bunch of little things like that. But it's tough to explain to someone that doesn't have experience with sheep and goats. But anybody who has seen a bunch of sheep and goats knows. Do both sheep and goats scream? Typically they make that sound when something is uncomfortable for them. The farmer walked by, and didn't feed them when he usually feeds them at that time. Or it could be that you may have just separated an offspring from its mother. So she could be calling for her offspring or complaining that her offspring wasn't with it. And is that what it really sounds like? That full-throated scream? Those sounds may have been enhanced a little bit, but it wasn't too far off from reality. Meanwhile, goats in general seem to be the darlings of popular culture these days. The Washington Post just ran a map of "literally every goat in the United States." And People magazine reported this week: "A brave North [daughter of Kim Kardashian and Kanye West] can be seen getting friendly with a goat, who is content to lie in the sun as she pats its back." Why are goats so popular? How Can You Tell If Your Goat Is Happy? Now We Know! As far as farm livestock go, goats seem to have a variety of behaviors that are individual, rather than sheep, which all do the same thing. So that's one thing [that makes goats appealing]. But this popularity that you're seeing, I don't think it has anything to do with that. It's just the whims of the Internet. What drew you to do research on goats and sheep? Sheep and goats can make use of land that doesn't have enough forage to produce cattle, doesn't have enough rainfall to produce crops. Sheep and goats can make use of that land and produce high-quality food and fiber [from their wool or hair]. My interest is in how we can use those animals to produce valuable products from marginal arid lands. The ability of goats and sheep to survive on arid land — is that why they are popular as livestock in the developing world? Very much so. In the developing world, few people have the resources to feed a cow well enough, but many of them can have a few goats or a few sheep. And these animals can be productive on limited resources. They're keeping the goats or sheep to produce food and fiber for their family.